"It's too bad the Post Office isn't as efficient as the Weather Service," Doc Brown says in the 1989 movie Back to the Future: Part II, referring to the fact that the weather could be manipulated by the government. But was that vision of the future really that futuristic? Controlling the weather sounds like it should be the exclusive domain of science fiction. But manipulation of the clouds has a somewhat surprising history in the real world. In fact, the U.S. military ran a secret, little-remembered weather control program during the Vietnam War. You can listen to me discuss the history of weather control over at Marketplace Tech. From March 1967 until July 1972 the U.S. military spent over $3 million per year conducting a top secret operation in Southeast Asia. The goal was to extend the monsoon season and flood the Ho Chi Minh Trail, the system of supply routes used by enemy fighters in Vietnam. The Americans hoped to cause landslides, wash out river crossings, and just generally disrupt the movement of North Vietnamese troops. It was the first large scale effort to manipulate the weather for military purposes. And it's still unclear how well it actually worked. The program went by many names. It was called at various times Operation Popeye, Operation Motorpool, and Operation Intermediary-Compatriot. Reportedly the name had to be changed so many times on account of people without the proper security clearances learning the name. Whatever you want to call it, the goals were ambitious. A power once thought to be only in the hands of your deity of choice was now a weapon to be wielded by Man. And in a strange way, some American forces saw it as more palatable way to fight by disrupting movement rather than bombing. "Make mud, not war," was the unofficial moniker of the Air Force pilots who carried out the missions. The project worked by seeding clouds over countries like Laos and Vietnam with silver iodide. Roughly 2,000 runs were conducted over the five years of the program. Cloud seeding was far from new in the late 1960s. There were extensive experiments by GE and the U.S. military after World War II. And ARPA was working with advanced computers in the early 60s to see how weather might be used in battle. But Operation Popeye was the first known successful use of weather control technology in combat. 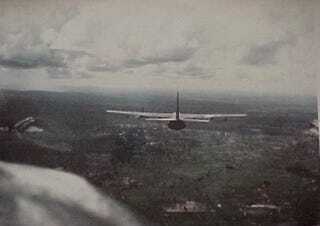 Although some claimed that [Operation Popeye] induced from 1 to 7 inches of additional rainfall annually along the Ho Chi Minh Trail, no scientific data were collected to verify the claim. General Westmoreland thought there was "no appreciable increase" in rain from the project. Even if the cloud seeding had produced a tactical victory or two in Vietnam (it did not), the extreme secrecy surrounding the operation and the subsequent denials and stonewalling of Congress by the military resulted in a major strategic defeat for military weather modification. The entire operation was naturally met with concern by the public once word of Operation Popeye started to leak out. Some people now go so far as to call the operation the "Watergate of weather warfare." Nixon administration officials initially denied the existence of the program when it first leaked in 1971. Columnist Jack Anderson at the Washington Post had broke the story in March of 1971. Denials from the Nixon administration were adamant and unequivocal. Nixon's secretary of Defense, Melvin Laird testified at a Senate hearing on April 18, 1972 that, "we have never engaged in that type of activity over Northern Vietnam." That was a baldfaced lie. By July of 1972 the New York Times had published their own story about the program with new details that freaked out the public. Operation Popeye even had a brief cameo appearance in the Pentagon Papers. News organizations were starting to paint a better picture of what the U.S. military was up to. Just a few days after the New York Times story broke, Operation Popeye was shut down. Under public pressure from people nervous about the U.S. military playing God, both houses of Congress rushed to pass legislation in 1974 to ban weather control for combat purposes. By 1974 a UN Treaty was in the works, but once it was signed in 1978 it was pretty much useless. It forbade countries from using environmental modification in war, but had so many loopholes that they may as well have not tried. The world may have agreed that control of the weather and climate was a dangerous weapon of war. But weather manipulation is still very much on the minds of U.S. intelligence agencies. Just last month a climate researcher reported that the CIA gave him a call to see about how technology might be used by a foreign power to disrupt our weather. It's probably safe to say that humanity hasn't seen the last of weather modification in war.